The autoimmune Uveitis is a immunological disorders, caused by your own immune system. Uveitis is inflammation inside the eye, affecting one or more of the three parts of the eye that make up the uvea: the iris (the colored part of the eye), the ciliary body (behind the iris, responsible for manufacturing the fluid inside the eye), and the choroid (the vascular lining tissue underneath the retina). Uveitis is the THIRD leading cause of blindness in the United States, after diabetes and macular degeneration. The immune system, generally protecting us from germs and cancer cells, can become deranged, dysregulated, with the result being an immune attack on part of one's own body. This state is termed autoimmunity, or immune attack against self. Autoimmune disease are those that result from the existence of autoimmunity. the most famous autoimmune disease is rheumatoid arthritis (RA). In RA, the white blood cells of the immune system become dysregulated or "confused" and begin to attack the individual's joints. A number of autoimmune diseases exist in which the eye or various parts of the eye may be attacked by white blood cells. Often the autoimmune disease is systemic, i.e., a variety of organs throughout the body system are being attacked. Examples of such diseases include rheumatoid arthritis, systemic lupus erythematosus, polyarteritis nodosa, scleroderma, relapsing polychondritis, and inflammatory bowel disease (ulcerative colitis and Crohn's disease). 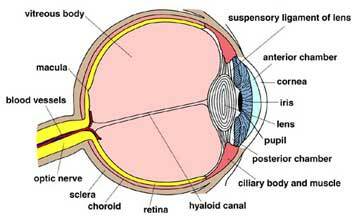 All these can affect the eye, causing corneal ulcers, sclerosis, uveitis, or other inflammation. Physicians must be able to identify the underlying cause to most effectively treat the uveitis. "Getting to the bottom of it," and definitely identifying the cause of the uveitis is critical, since the best choice of treatment is so dependent on the underlying cause. The proper treatment for one cause would in many instances be deleterious in the care of patients with uveitis from another cause. Regardless of the form of autoimmunity, any autoimmune disease affecting the eye will require systemic (e.g., oral as opposed to local, topical, ocular) therapy. the components of the immune system reside not in the eye, but rather are systemic and, therefore, regulation of those components will require systemic therapy. The treatment is generally beginning with steroid drops, advancing to steroid injections and/or pills, adding an oral, non-steroidal anti-inflammatory medication, and culminating in the use of an immunomodulatory, chemotherapeutic drug if the patient's uveitis continues or continues to recur each time the steroid medications are tapered and stopped.